I haven’t raced a half marathon in a long time. 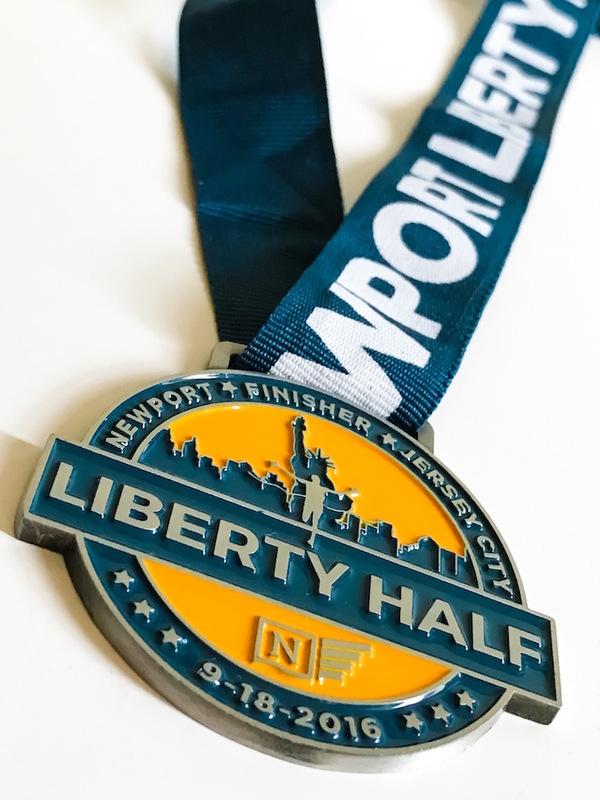 Sure, I’ve run half marathons, but it’s been about four and a half years since I actually tried to run a fast half and cared about my time. That was about a month before I decided to transition. Granted, I also haven’t raced much in the way of any distance in the last two years, but it’s certainly been the longest for the half. So I was due. I should also mention the bigger point here, this was also my first race of any kind since having surgery in January. It’s definitely been a while since I’ve pinned a bib on. I had 20 miles on the schedule for the day and I tend to prefer to do extra miles before a race rather than after. I like being able to run the race without needing to worry about leaving something in my legs for after. So I got up early to knock out 10k before the race. I ran my normal four mile route and then ran to the race start where my wife was waiting for me with a towel, some water, and a Kind bar. My run ended up being more like 6.4 miles than an even 6.2, but close enough. I was already dripping sweat thanks to 93% humidity so I decided it was gonna be a sports bra only race for me…a first. I even took a poll on Twitter the night before to see where most people pin their bibs. I went with on my shorts on my left hip. It was perfect. I didn’t have a hard goal in mind for the race. I wanted to push it hard, but not a full 100%. 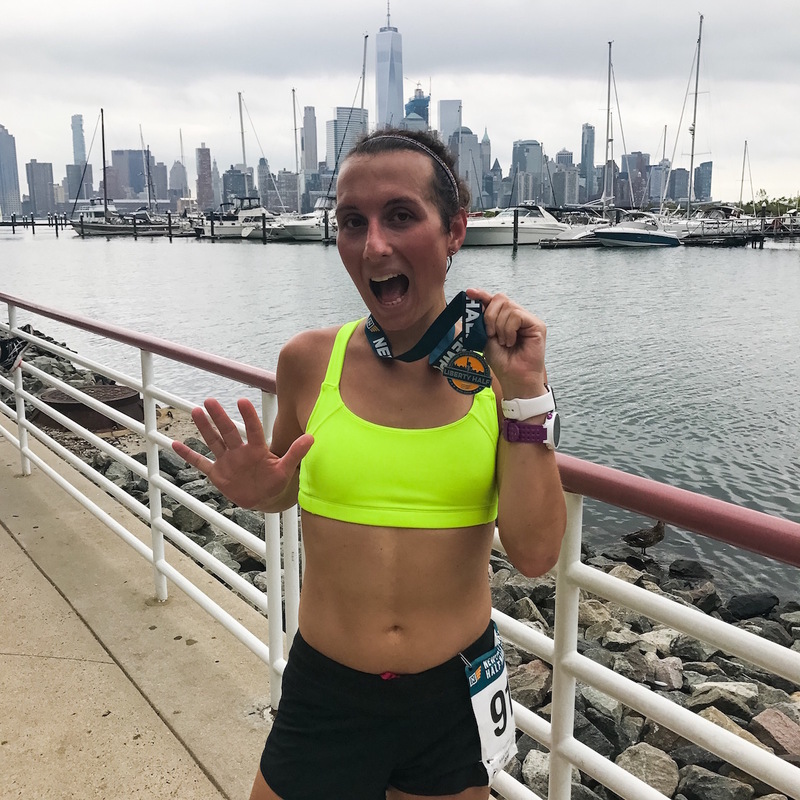 With this coming at the end of my first marathon training peak week, I wanted to test out my training and get a good feel for where I was at for Chicago in three weeks. 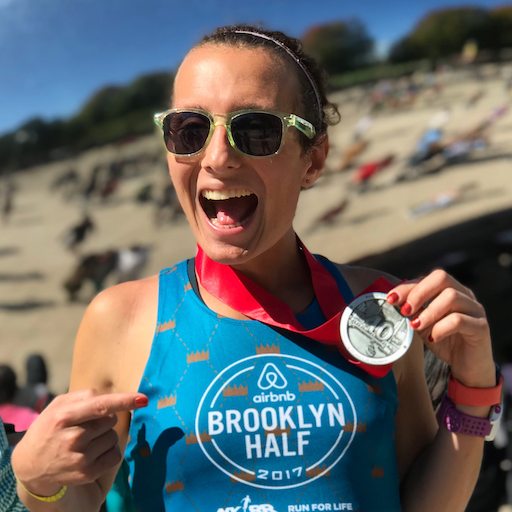 At the same time, I hadn’t tapered or done anything to set myself up for success—which is fine because my number one priority is my marathon. I figured I’d run in the low 1:40s with an appropriate effort. Yeah, I don’t really know what “appropriate effort” means either, but that’s about how I’d describe my plan. I got into the corral and started with my friend Miranda. 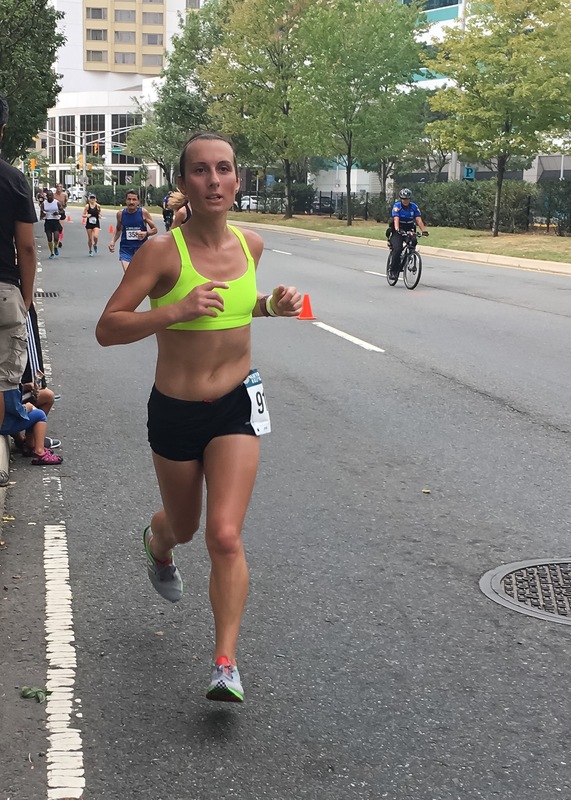 She’s also marathon training and her goal was to stay just under an 8:00 mile pace. That seemed like a good place to be so I said I’d probably stick near her. Mile 2 flew by in the blink of an eye. We dropped just over 20 seconds off the pace. Big oops. Just before the marker, I saw my wife on the side cheering. I flew by waving at her with both hands and being all around silly about it. This is about when I started to lose Miranda. I kept things steady through mile three, but started realizing in mile four that I should slow myself down a bit. Miles four and five were 7:22 and 7:24. By mile six I was starting to feel the effects of starting out too fast and slowed down into the low 7:30s. The miles in Liberty State Park were nice and familiar. There were no surprises which helped keep me on track and made it feel just like a training run—even though the route was a bit different than I typically do through the park. Approaching mile ten, I was really feeling it, but kept telling myself I just had 5k left. As we passed by the marina, I tried to make sure I had the room I needed for the bumpy part of the path right before the boat launch. I run this section of the path in both directions almost every day and it’s a bit rough. The path is really uneven and bumpy. But I’ve run it so much that I’ve mapped out where each step should land through the entire stretch to get through as easily as possible. I came down this section on the right side of the path nice and clean and then looped around the boat launch and out of the park. From here on, it was just hang on and make it to the finish. The eleventh mile marker snuck right up as my time slowed a tad more to 7:39. 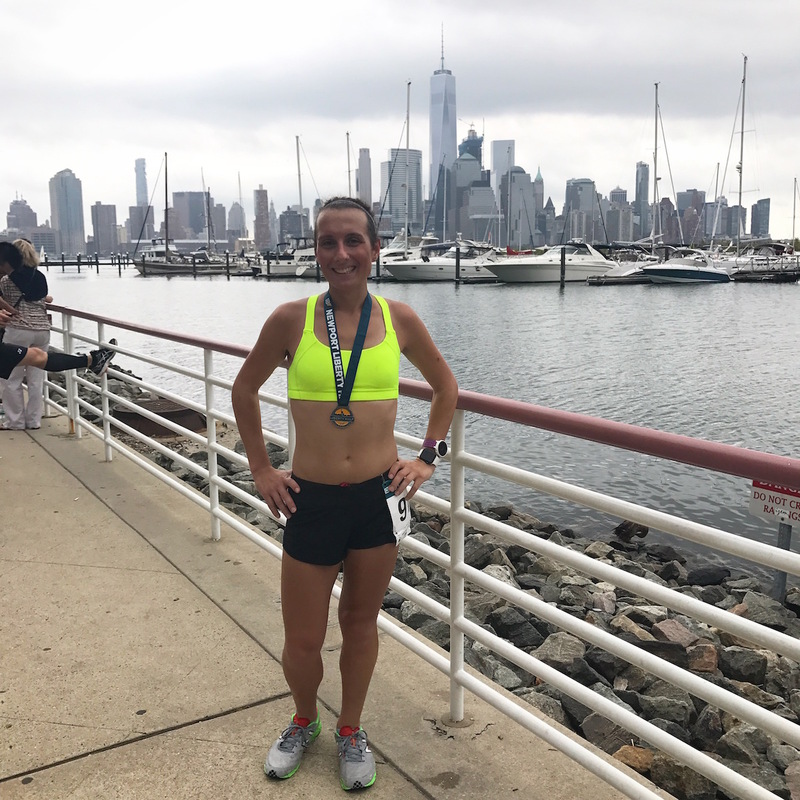 I had passed the twelfth mile marker on my pre-race miles so I knew exactly where it was and just focused on getting to that point. 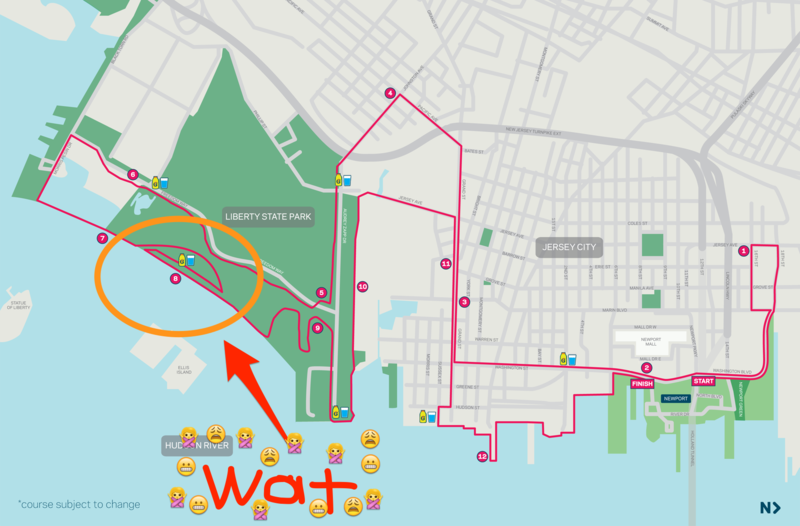 And from there, the course followed along the same way I finished my pre-run miles so I just replayed that in my head. I knew exactly where I was going and what was left. This was a huge boost. As I came down the last stretch, I passed my wife again, as well as my speedy friend Sarah—she placed 5th overall!—just before the final turn to the finish. I looked at the clock and saw I had just enough time left to squeeze in under 1:40 without having to push more. I was beat so I just coasted my way in. Any extra seconds I could have knocked off here weren’t important to me at that point. I cruised past the finish line and bent over like I was going to throw up, just like how I finish most races! After gulping down some water, I met up with my wife and checked the printout of the times. 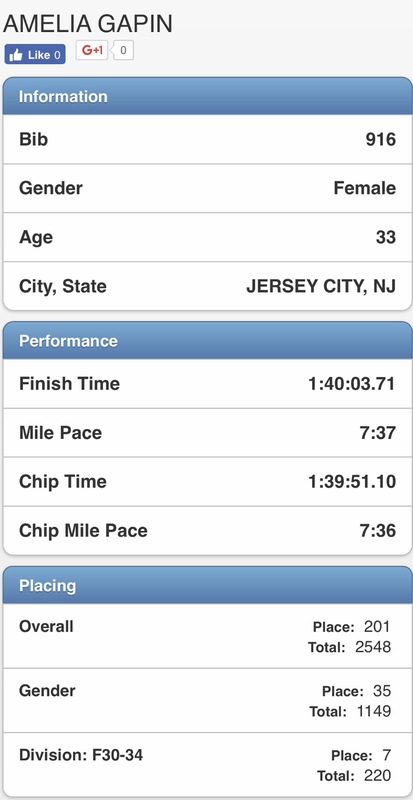 My ears were literally clogged with sweat, I was dehydrated, and I was still in a post-race daze so when I looked my time, I only looked at the clock time and not my chip time. I wasn’t really thinking quite straight yet. I saw 1:40:03! I was pissed! I thought I had a few extra seconds there at the finish! I could have pushed enough to make it! It was stupid, but I was bummed about that. It wasn’t until about a half hour later when I checked online that I saw my chip time was 1:39:51 and I came in 7th in my age group. Everything felt right again! 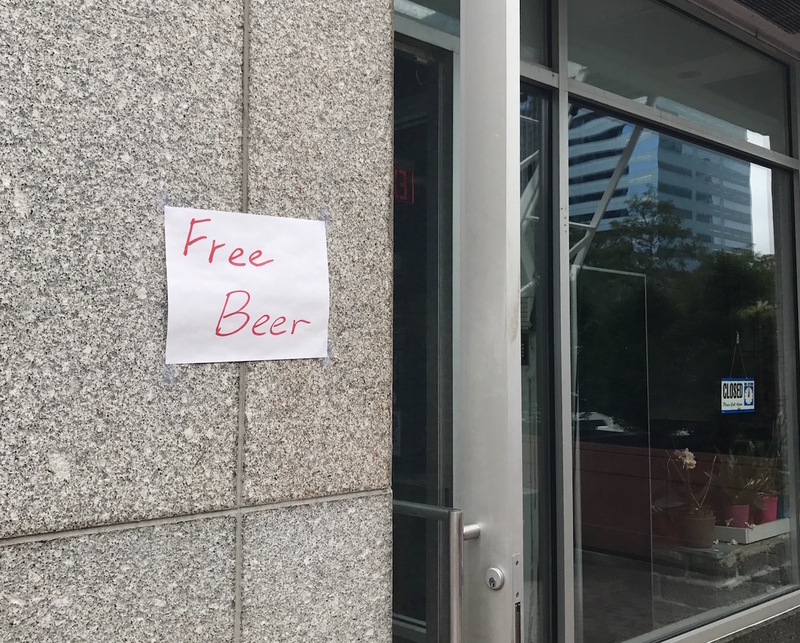 We hung around for a little bit with Miranda and grabbed our free beers before calling it a day and walking home. I was pretty proud of my effort! Usually, I think you learn a lot more from failure or a bad race, but I actually have a lot of takeaways from this race. Mostly, they’re things I already knew, but had forgotten since it’s been little while. First off, I need to race more. I’m rusty. I forgot what it’s like to push through at the end of race. It’s nothing like pushing on a hard run. Control is also a thing I need to work on. I’ve never been particularly good at controlling my pace early in a race and this has definitely been a big worry for me over the last few weeks as I look ahead to marathon day. I’m worried about starting off too fast. I’m really bad at slowing myself down even when I know I need to. It’s like my legs get into a certain rhythm and I can’t pull them back from there. If I can find the right pace early, I can usually keep it and even end up with a negative split. I took off too fast for the first few miles of this race and got in trouble later because of it. I just happened to be lucky enough to still sneak in with a great time, but I was struggling through the last 5k. Running a race on a familiar route can make a huge difference. When you know the course like the back of your hand, it’s easy to wrap your head around the miles ahead. You know where they are and where they go. A trick I often do late in marathons is pretend I’m running on my normal route at home. I visualize myself with the same distance left on a training run as I have left in the race. I picture where I would be and what would be around me. With this course, I didn’t even have to do that. I was already on familiar paths and streets. It absolutely helped a lot! Lastly, I’ve forgotten how to drink water while running at race effort, it would seem. I only took water twice, but I splashed it right up my nose the second time. I swear I used to be really good at this. I probably should have taken more water during the race as practice.